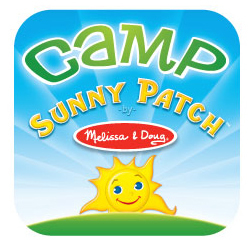 Melissa & Doug is thrilled to announce the launch of their first-ever virtual summer camp: Camp Sunny Patch! All season long, their blog will feature exciting original play ideas to help you add a little bit of structure and a whole lot of fun to summer vacation. Each weekly camp activity, written by favorite bloggers, features a creative new way to get your kids moving their bodies and using their imaginations in the great outdoors . . . and you never have to leave your own backyard! Just check out the weekly activity online to get inspired, then get outside and start having a blast. Download a weekly badge for each session your kids complete, and you can paste it on the printable Camp Sunny Patch poster (available exclusively on our blog and to our email subscribers!). They’ll have special camp-themed surprises throughout the summer for Melissa & Doug Facebook fans, too. Remember to sign up and tune in to get the latest on giveaways, albums, contests and more. Check out the June Activities Printable Poster here!